The course of rehabilitation for a PCL injury is dependent on the degree of injury and type of treatment rendered (ie, operative vs nonoperative). The key to nonoperative treatment is to control the swelling, instability, and pain. Rehabilitation includes early prone passive mobilization with progressive weight bearing, preventing posterior tibial subluxation, and quadriceps strengthening. Overall, rehabilitation for a PCL injury should take longer than for an ACL injury. The natural history of sports-related PCL injuries that are treated nonoperatively is quite good. In one study with a mean follow-up of 6.2 years, 80% of patients were satisfied with their knees and 84% had returned to their previous sport (68% at the same level of performance, 16% at a decreased level of performance). A subsequent, prospective study with a mean follow-up of 5.4 years found that 50% of athletes with isolated posterior laxity returned to the same sport at the same or higher level of performance and that 33% returned to the same sport at a lower level of performance (no patient had greater than grade II injuries). In addition, the grade of laxity noted on physical examination did not change over the course of follow-up, and the grade of laxity did not correlate with radiographic joint-space narrowing. Another study involving MRI follow-up imaging found that all low-grade and midgrade PCL injuries healed with continuity, and 19 of 22 high-grade injuries healed (4 healed with normal contour; 15 healed with continuity and altered morphology). In many cases that involve less severe PCL tears, patients are recommended to undergo conservative therapy with a progressive rehabilitation program. However, if the patient continues to experience chronic pain and instability despite therapy and functional bracing, a PCL reconstruction may be required. The choice of which route of treatment depends on the severity of the specific injury, whether the PCL injury is isolated or in combination with other ligamentous or meniscal damage, the activity level and goals of the patient, and the individual physician preference. The stages of physical therapy are discussed here and are broken into the following 2 types of rehabilitation: nonoperative and operative (ie, PCL reconstruction). Many isolated PCL injuries are missed at the time of the initial injury. The patient often cannot remember injuring the knee and often seeks medical attention at a later time. The pain, degree of swelling, and disability associated with ACL and MCL injuries is often missing from the patient’s history. Many are able to walk with normal gait immediately after the injury, and the soft endpoint of the posterior drawer test is firm by 2-3 weeks after injury (though more laxity is noted when compared to the uninjured knee). With higher-grade injuries, usually grade III +/- other ligamentous injury, the patient typically seeks medical attention immediately. In such cases, the physician should order an MRI to evaluate all the knee ligaments and assess for subchondral injury or further intra-articular pathology. The goal of the rehabilitation for individuals undergoing a conservative program is to control the initial inflammatory phase and regain ROM with muscle function as quickly as possible. Apply the rest, ice, compression, and elevation (RICE) method several times a day, in addition to any other modalities incorporated by the physical therapist to control pain and swelling (eg, electrical stimulation, cold whirlpool). Patients with grade I and grade II injuries can bear weight as tolerated immediately, though some may require axillary crutches initially. Axillary crutches and a long leg brace are recommended for grade III injuries and with other associated ligamentous laxity (ie, posterolateral corner injury) or intra-articular damage. Functional electrical stimulation (FES) may be used to stimulate the quadriceps muscle, but it is probably necessary only if the quadriceps muscle is shut down secondary to pain. The physical therapist should instruct the patient in exercises for quadriceps and hip strengthening (eg, quadriceps sets, straight leg raises, hip abduction/adduction, multiangle quadriceps isometrics). At this time, all open kinetic chain (OKC) hamstring exercises should be avoided since they impart posterior tibial translation at the knee. Several different techniques may be used to reconstruct the PCL, so the treatment protocol is determined by the individual physician and the type of graft used in surgery. Postoperatively, it is very important to control pain and swelling through the use of cold therapy, compression, and elevation. The patient may bear weight as tolerated on the operated limb with the use of 2 crutches and a long leg brace. Patellar mobility is important, and the patient should be instructed in self-mobilization exercises for the patella, scar, and soft tissues surrounding the kneecap to prevent fibrosis. ROM should be initiated (0-90°), emphasizing full passive knee extension. Other examples of exercises that may be initiated include quadriceps sets, ankle pumps, straight leg raises, and upper body strengthening. A right knee pending posterior cruciate ligament (PCL) reconstruction. A minimal notchplasty is completed. 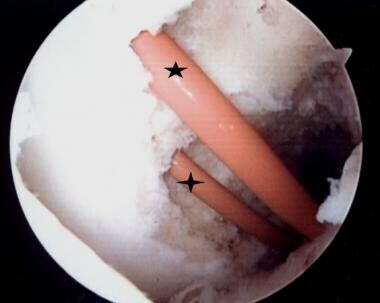 Two guide pins are advanced into the medial femoral condyle for tunnel placement to reconstruct the 2 bundles of the PCL. The 2 tunnels are created by reaming from outside in; 8- to 9-mm tunnels are made depending on patient size and the graft that will be used. Two red Robinson catheters are advanced through the femoral tunnels. The catheters have premade holes, which are used for suture retrieval. The catheters are advanced and threaded out the posterior knee. In this case, a posterior tibial onlay graft from an Achilles tendon allograft is used. The 2 bundles are secured to the catheters and advanced into the joint through the tunnels. The 2 Achilles tendon bundles are secured with a baseball whipstitch, are threaded through the catheter holes, and are advanced into the femoral condyle tunnels. Additional view of the placement and advancement of the Achilles allograft. Completion and seating of the femoral allograft reconstruction. The 2 bundles are secured or stabilized by suturing over a post and washer. 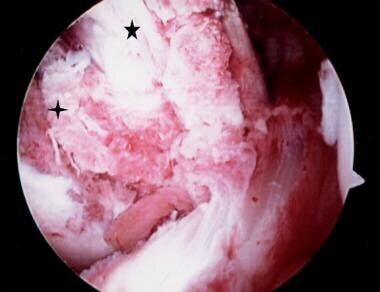 Note the reestablishment of the broad surface area for the reconstructed posterior cruciate ligament origin. Completion of the tibial onlay, 2-bundle Achilles tendon allograft/posterior cruciate ligament (PCL) reconstruction. The bony calcaneus remnant is secured to the posterior tibia with 1 or 2 interfragmentary compression screws into a trough into the posterior tibia at the level of the PCL insertion. Care is taken to not penetrate the anterior tibial cortex with these screws. Note the intact original anterior cruciate ligament. 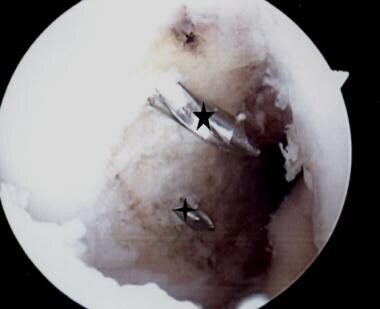 Hermans et al conducted a long-term follow-up study to determine which factors impact the results of isolated, arthroscopically assisted reconstruction of the PCL's anterolateral bundle. Utilizing a mean follow-up period of 9.1 years, the report investigated postoperative outcomes in 25 patients, 13 of whom had chondrosis at the time of surgery. Surgical interventions included bone-patellar tendon-bone (BPTB) autografts (9 patients), semitendinosus gracilis (STG) autografts (15 patients), and an Achilles tendon allograft (1 patient). The mean final International Knee Documentation Committee, Lysholm, and functional visual analog scale scores (65, 75, and 8, respectively) for the patients were significantly higher than the preoperative scores (38, 50, and 4, respectively). However, a significant reduction was found in the final postinjury, versus the preinjury, Tegner activity score (5.7 v 7.2, respectively). In addition, postoperative anteroposterior laxity scores were higher in the surgically treated knees. Functional scores for patients who received either BPTB or STG reconstruction were not significantly different. Final functional results were significantly better in patients with no cartilage damage at the time of surgery and in those who underwent surgery within 1 year postinjury. Consultation with an orthopedic surgeon is needed for patients requiring operative intervention. The recovery phase discussed here encompasses treatment from 2-12 weeks. The goal of this phase, in higher-grade injuries, is to advance weight bearing and achieve a normal gait pattern, along with a progression of functional strengthening and ROM. For those patients who undergo graft reconstruction, it is especially important to protect the graft during this period, as it is at its weakest state in the healing process. Only patients with grade III injuries should continue to wear a brace (0-60°) until at least the third week of therapy. Shortly thereafter, the patient may be fitted for a functional knee brace. Weight bearing may be progressed as tolerated, and the crutches may be discontinued at approximately 2-3 weeks. At 2-3 weeks, the exercises performed in the acute phase should be progressed with light resistance as tolerated. Stationary bicycling may be recommended for improving ROM. Aquatic exercises may be recommended to improve ROM and strengthening. As the patient progresses into weeks 3-6, the exercises may be progressed to include closed kinetic chain (CKC) exercises (eg, leg press, mini squats, stair stepper, step-ups). Resistance may be increased on the bicycle as tolerated. At 8-12 weeks, the strengthening exercises should be progressed and a light jogging program may be initiated. The patient gradually should improve ROM (0-130°) during this time. Passive stretching is used as necessary to regain mobility. Patellar mobilization continues to be important. Modalities may be continued as needed for pain and swelling. Weight bearing is progressed as tolerated, and crutches are discontinued at the discretion of the physician. At 4-6 weeks, the patient may be fitted for a functional knee brace. Strengthening exercises may be progressed to include CKC exercises. Aquatic resistance training may be initiated during the later part of this phase. See Surgical Intervention, Acute Phase. The maintenance phase (4 mo to 1 y) is the final phase of rehabilitation. This phase prepares the athlete for return to competition. Goals are focused on increasing strength, power, and endurance. Strengthening and proprioception exercises are continued and progressed as tolerated. Plyometrics and sport-specific training should be initiated and accelerated as tolerated. A running program is developed, and agility drills are incorporated. An isokinetic test and a KT-2000 test should be performed at 3-month, 6-month, 9-month, and 12-month follow-up visits. The athlete may return to sporting activities when isokinetic and functional tests are satisfactory (determined by the physician), in addition to satisfactory clinical examination findings. The patient should not return to competitive sports until full quadriceps strength has been reestablished. After completing the rehabilitation program, 68% of patients return to their previous level of competitive function. Radiographic signs of arthritis show up in 31% of patients. At the time of arthrotomy, 64% of patients had degenerative medial compartment changes. Significant degenerative changes developed in 44% of patients. Operative intervention is required in 42% of patients. Functional strengthening, as well as balance and proprioception, is progressed. Light jogging may be progressed to running and various agility drills as tolerated. Advanced plyometrics and sports-specific training should be incorporated. Isokinetic strength and KT-2000 testing often are performed; however, the necessity of these tests has not been validated to affect outcome. Wang CJ. Injuries to the posterior cruciate ligament and posterolateral instabilities of the knee. Chang Gung Med J. 2002 May. 25(5):288-97. Margheritini F, Rihn J, Musahl V, Mariani PP, Harner C. Posterior cruciate ligament injuries in the athlete: an anatomical, biomechanical and clinical review. Sports Med. 2002. 32(6):393-408. Sanders TL, Pareek A, Barrett IJ, Kremers HM, Bryan AJ, Stuart MJ, et al. 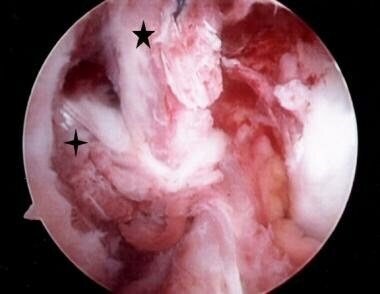 Incidence and long-term follow-up of isolated posterior cruciate ligament tears. Knee Surg Sports Traumatol Arthrosc. 2016 Feb 27. [Medline]. Sheps DM, Otto D, Fernhout M. The anatomic characteristics of the tibial insertion of the posterior cruciate ligament. Arthroscopy. 2005 Jul. 21(7):820-5. Amis AA, Gupte CM, Bull AM, Edwards A. Anatomy of the posterior cruciate ligament and the meniscofemoral ligaments. Knee Surg Sports Traumatol Arthrosc. 2006 Mar. 14(3):257-63. Nha, KW, Bae, JH, Kwon, JH, et al. Arthroscopic posteromedial drive-through test in posterior cruciate ligament insufficiency: a new diagnostic test. Knee Surg Sports Traumatol Arthrosc. February 2014. [Medline]. [Guideline] Pierce CM, O'Brien L, Griffin LW, Laprade RF. Posterior cruciate ligament tears: functional and postoperative rehabilitation. Knee Surg Sports Traumatol Arthrosc. 2012 Apr 8. [Medline]. [Guideline] Lee BK, Nam SW. Rupture of posterior cruciate ligament: diagnosis and treatment principles. Knee Surg Relat Res. 2011 Sep. 23(3):135-41. [Medline]. [Full Text]. Chen B, Gao S. Double-bundle posterior cruciate ligament reconstruction using a non-hardware suspension fixation technique and 8 strands of autogenous hamstring tendons. Arthroscopy. 2009 Jul. 25(7):777-82. [Medline]. Lim HC, Bae JH, Wang JH, et al. Double-bundle PCL reconstruction using tibial double cross-pin fixation. Knee Surg Sports Traumatol Arthrosc. 2010 Jan. 18(1):117-22. [Medline]. Lenschow S, Zantop T, Weimann A, Lemburg T, Raschke M, Strobel M. Joint kinematics and in situ forces after single bundle PCL reconstruction: a graft placed at the center of the femoral attachment does not restore normal posterior laxity. Arch Orthop Trauma Surg. 2006 May. 126(4):253-9. Kim SJ, Kim TE, Jo SB, et al. 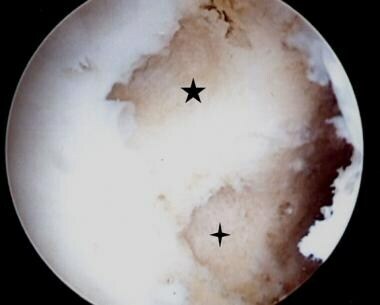 Comparison of the clinical results of three posterior cruciate ligament reconstruction techniques. J Bone Joint Surg Am. 2009 Nov. 91(11):2543-9. [Medline]. Jung TM, Höher J, Weiler A. Screw fixation of a 4 1/2-year-old PCL avulsion injury. Knee Surg Sports Traumatol Arthrosc. 2006 May. 14(5):469-72. Ahn JH, Yoo JC, Wang JH. Posterior cruciate ligament reconstruction: double-loop hamstring tendon autograft versus Achilles tendon allograft--clinical results of a minimum 2-year follow-up. Arthroscopy. 2005 Aug. 21(8):965-9. Ahn JH, Nha KW, Kim YC, Lim HC, Nam HW, Wang JH. Arthroscopic femoral tensioning and posterior cruciate ligament reconstruction in chronic posterior cruciate ligament injury. Arthroscopy. 2006 Mar. 22(3):341.e1-4. Jung YB, Jung HJ, Tae SK, Lee YS, Yang DL. Tensioning of remnant posterior cruciate ligament and reconstruction of anterolateral bundle in chronic posterior cruciate ligament injury. Arthroscopy. 2006 Mar. 22(3):329-38. Sekiya JK, West RV, Ong BC, Irrgang JJ, Fu FH, Harner CD. Clinical outcomes after isolated arthroscopic single-bundle posterior cruciate ligament reconstruction. 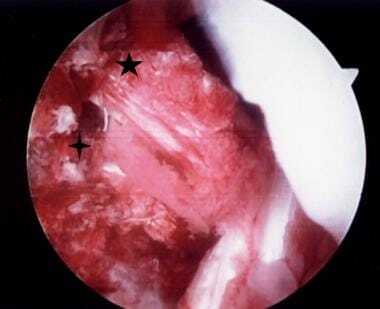 Arthroscopy. 2005 Sep. 21(9):1042-50. Goudie EB, Will EM, Keating JF. Functional outcome following PCL and complex knee ligament reconstruction. Knee. 2009 Sep 29. [Medline]. Hermans S, Corten K, Bellemans J. Long-term results of isolated anterolateral bundle reconstructions of the posterior cruciate ligament: a 6- to 12-year follow-up study. Am J Sports Med. 2009 Aug. 37(8):1499-507. [Medline]. Strobel MJ, Weiler A, Schulz MS, Russe K, Eichhorn HJ. Arthroscopic evaluation of articular cartilage lesions in posterior-cruciate-ligament-deficient knees. Arthroscopy. 2003 Mar. 19(3):262-8. Baker CL Jr, Norwood LA, Hughston JC. Acute combined posterior cruciate and posterolateral instability of the knee. Am J Sports Med. 1984 May-Jun. 12(3):204-8. [Medline]. Bergfeld JA, McAllister DR, Parker RD, et al. The effects of tibial rotation on posterior translation in knees in which the posterior cruciate ligament has been cut. J Bone Joint Surg Am. 2001 Sep. 83-A(9):1339-43. [Medline]. Cain TE, Schwab GH. Performance of an athlete with straight posterior knee instability. Am J Sports Med. 1981 Jul-Aug. 9(4):203-8. [Medline]. Clancy WG Jr, Shelbourne KD, Zoellner GB, et al. Treatment of knee joint instability secondary to rupture of the posterior cruciate ligament. Report of a new procedure. J Bone Joint Surg Am. 1983 Mar. 65(3):310-22. [Medline]. Daniel DM, Stone ML, Barnett P, Sachs R. Use of the quadriceps active test to diagnose posterior cruciate-ligament disruption and measure posterior laxity of the knee. J Bone Joint Surg Am. 1988 Mar. 70(3):386-91. [Medline]. Donovan. Posterior cruciate ligament injury on artificial turf. Orthop. 1977. 1:20. Fowler PJ, Messieh SS. Isolated posterior cruciate ligament injuries in athletes. Am J Sports Med. 1987 Nov-Dec. 15(6):553-7. [Medline]. Janousek AT, Jones DG, Clatworthy M, et al. Posterior cruciate ligament injuries of the knee joint. Sports Med. 1999 Dec. 28(6):429-41. [Medline]. Ogata K, McCarthy JA, Dunlap J, Manske PR. Pathomechanics of posterior sag of the tibia in posterior cruciate deficient knees. An experimental study. Am J Sports Med. 1988 Nov-Dec. 16(6):630-6. [Medline]. Paddu G, Gianni E, Chambat P. The axial view in evaluating tibial translation in cases of insufficiency of the posterior cruciate ligament. 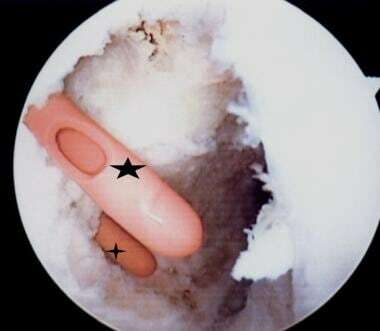 Arthroscopy. 2000. 16(2):217-220. Safran MR, Allen AA, Lephart SM, et al. Proprioception in the posterior cruciate ligament deficient knee. Knee Surg Sports Traumatol Arthrosc. 1999. 7(5):310-7. [Medline]. Shelbourne KD, Davis TJ, Patel DV. The natural history of acute, isolated, nonoperatively treated posterior cruciate ligament injuries. A prospective study. Am J Sports Med. 1999 May-Jun. 27(3):276-83. [Medline]. Shelbourne KD, Jennings RW, Vahey TN. Magnetic resonance imaging of posterior cruciate ligament injuries: assessment of healing. Am J Knee Surg. 1999. 12(4):209-13. [Medline]. St Pierre P, Miller MD. Posterior cruciate ligament injuries. Clin Sports Med. 1999 Jan. 18(1):199-221, vii. [Medline]. Veltri DM, Warren RF. Isolated and combined posterior cruciate ligament injuries. J Am Acad Orthop Surg. Nov 1993. 1(2):67-75. A normal lateral radiograph of a knee. In a normal knee, a line drawn along the posterior femoral condyle will not intersect the posterior tibial condyle. A lateral radiograph of a knee with a posterior cruciate ligament injury. Note that the same line as in the above image will bisect the posterior tibial condyle due to a posterior sag and an incompetent posterior cruciate ligament. The posterior tibial sag sign. The photo on the left demonstrates the clinical finding of the posterior tibial sag sign. A line drawn parallel to the patella accentuates the posterior tibial sag. The photo on the right demonstrates the quadriceps active drawer test described by Daniels. With the knee in 70-90° of flexion, the extensor mechanism is contracted, pulling the tibia anteriorly into a reduced position. 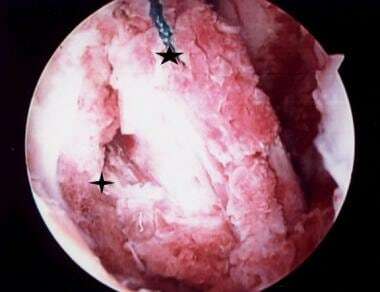 A close-up view of a posterior tibial sag with an incompetent posterior cruciate ligament. This MRI of the knee shows a torn posterior cruciate ligament. This MRI (coronal section) shows a posterior cruciate ligament tear. This transverse MRI shows edema to the torn posterior cruciate ligament. A view of the broad origin of the posterior cruciate ligament (PCL) on the medial femoral condyle of a left knee. The anterior cruciate ligament has been removed for surgical reconstruction. 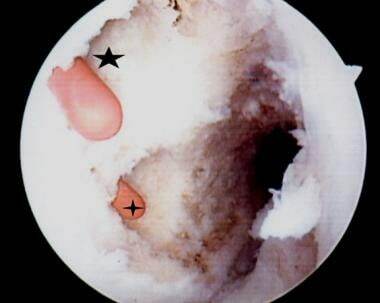 An additional view of the posterior cruciate ligament broad origin and insertion in a knee pending anterior cruciate ligament reconstruction.